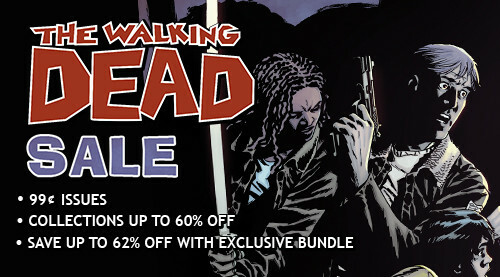 All of The Walking Dead On Sale at ComiXology! Craving More of The Walking Dead? Read The Comics That Started It All! The first 121 issues are on sale for 99 cents each with Volumes 1-19 on sale starting at $4.99! , as well as collected editions Volume 1 through Volume 19 on sale starting at $4.99!
! That’s seventy-five cents apiece! The bundle and sale are available only from Friday, March 28th until midnight EST Monday March 31st. Michelin Star Chef Carrie Nahabedian of NAHA and Brindille will cook for Rick Bayless, author Sara Paretsky, New Yorker cartoonist Pat Byrnes, host Elysabeth Alfano and YOU! Enjoy, food, Vosges chocolate, Voss Artesian Water from Norway, wine, unscripted conversation and a few performances! PLUS, singer Joan Collaso is the opening act. Chef Nahabedian will be making Celery, Chestnut Scotch Soup and Rabbit Rillette Ravioli. Watch her below! for THE DINNER PARTY on March 31. On The Dinner Party, Alfano invites 3 Chicago or national celebs and a known chef who cooks for them and the audience. Over food, wine, chocolate and artist performances, the conversations and the unexpected flow. Filmed in front of a live audience, come to Chicago City Winery to share in the food, wine, water, chocolate and conversation. Can't make the City Winery? You can also watch THE DINNER PARTY on-line in the "Splash" section of the Sun Times. Viewers and audience members can tweet in to be a part of this fantastic new multi-dimensional show. Doors Open at 6:30 pm. Show, food, water, chocolate and wine for the audience start at 7 pm. Future Dinner Parties are May 12. "Chicago Fire" Star Jesse Spencer To Be Honored by Chicago International Film Festival TV Awards April 10! The Chicago International Film Festival Television Awards will honor Jesse Spencer, best known for his portrayals of Matthew Casey on Wolf Films/Universal Television drama "Chicago Fire" (which airs Tuesdays, 8 p.m. CT on NBC) and Dr. Robert Chase on "House," with the Artistic Achievement Award. The celebratory evening will be April 10, 2014 at the Radisson Blu Aqua Hotel (221 N. Columbus Dr.). The awards presentation will be hosted by Jay Levine, CBS 2 Chief Correspondent and Mary Ann Childers, a media consultant and veteran Chicago journalist. In 2014, the Chicago International Film Festival Celebrates 50 years of honoring the best in television. Other honorees this year include “CSI” Executive Producer Carol Mendelsohn, who will receive the Commitment to Excellence Award for Television, the production company STORY, which will receive this year’s Commitment to Excellence Award for Television Commercials, and the WTTW11 Audience Choice Award. All awards will be presented at the Awards Ceremony on April 10. An Australian native, Spencer made his American television debut in the critically-acclaimed Fox series “House,” playing Dr. Robert Chase opposite Hugh Laurie for all of the show's eight seasons until the series ended in May 2012. Spencer is currently starring in the NBC hit drama “Chicago Fire” as Matthew Casey, a strong, intuitive Lieutenant who leads the Truck company and is unwavering in his commitment to the job. Spencer's film credits include a starring role in "Uptown Girls" with Brittany Murphy, the biopic "Swimming Upstream" with Geoffrey Rush and Judy Davis, as well as Spike Lee's independent feature "Girl Is in Trouble." He has worked extensively in the U.K. and Australia, both in television and theater. He starred in the acclaimed BBC drama "Death in Holy Orders" and has had starring roles in the BBC adaptation of "Lorna Doone" and Hallmark's "Stranded." He began his career starring in the long-running Australian soap, “Neighbours." Tickets ($100) to the 50th Chicago International Television Awards are available at chicagofilmfestival.com. The 50th Chicago International Film Festival Television Awards is presented by Cinema/Chicago and the Chicago International Film Festival. Major Partners include American Airlines, Optimus, Sound Investment AV with support from Evening Partners Action Booth, Effen Vodka, Stella Artois and WTTW11. The Chicago International Film Festival Television Awards is an annual international television competition culminating in an Awards Ceremony that honors the best TV commercials and television productions from around the world. Among last year’s top winners, Gold and Silver Hugos were awarded to Icon Films, Yap Films, WDR, THIRTEEN, Leo Burnett, mcgarrybowen, Yessian Music, Burrell, and Cutters. The event has honored Kelsey Grammer, Bill Kurtis, Carol Marin, FRONTLINE, Leo Burnett, ESPN Films, and Optimus, among others. Cinema/Chicago is a not-for-profit cultural and education organization dedicated to encouraging better understanding between cultures and to making a positive contribution to the art form of the moving image. The Television Awards is part of the year-round programs presented by Cinema/Chicago, which also include the Chicago International Film Festival, CineYouth Festival, Intercom Competition, International Screenings Program, and Educational Outreach. Celebrity facialist, Joanna Vargas will be at Bloomingdales in Chicago!